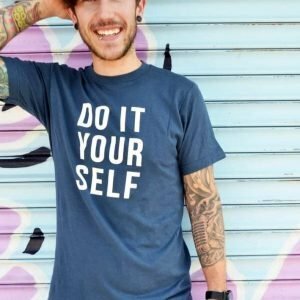 A lot of the projects that are completed in my home are done by myself (it’s way more rewarding that way). So, when it came time to replace my ugly retro carpet, I figured why not teach everyone how to lay down their own laminate flooring? While it may not save you time, it sure does save your wallet A LOT of money. So why not give it a shot? 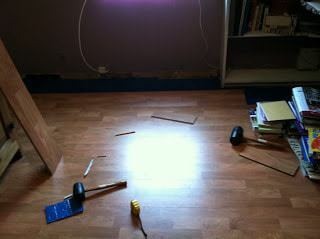 For this project I picked up some laminate flooring that looks like wood floors. I found these floors on closeout at Lumber Liquidators and purchased them for 59 cents a square foot! 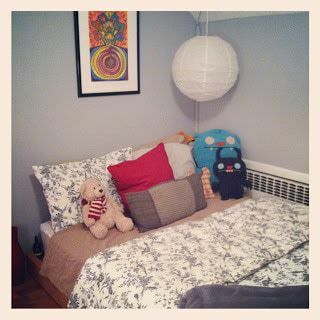 My entire bedroom (including the cost of the floor padding) was less than $100! If you can’t complete this project in a day, don’t get discouraged! 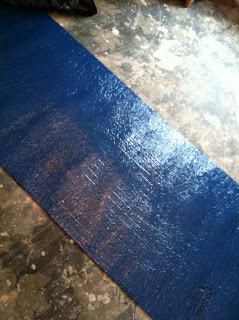 The flooring, plus the new paint job was a weekend-long project! But, as you can see by this before and after picture, the outcome was totally worth the work! 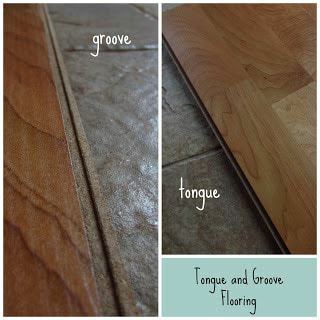 Most laminate wood floorboards (and regular wooden floorboards too) have what is known as “tongue and groove”joints that lock together to keep the flooring in place. 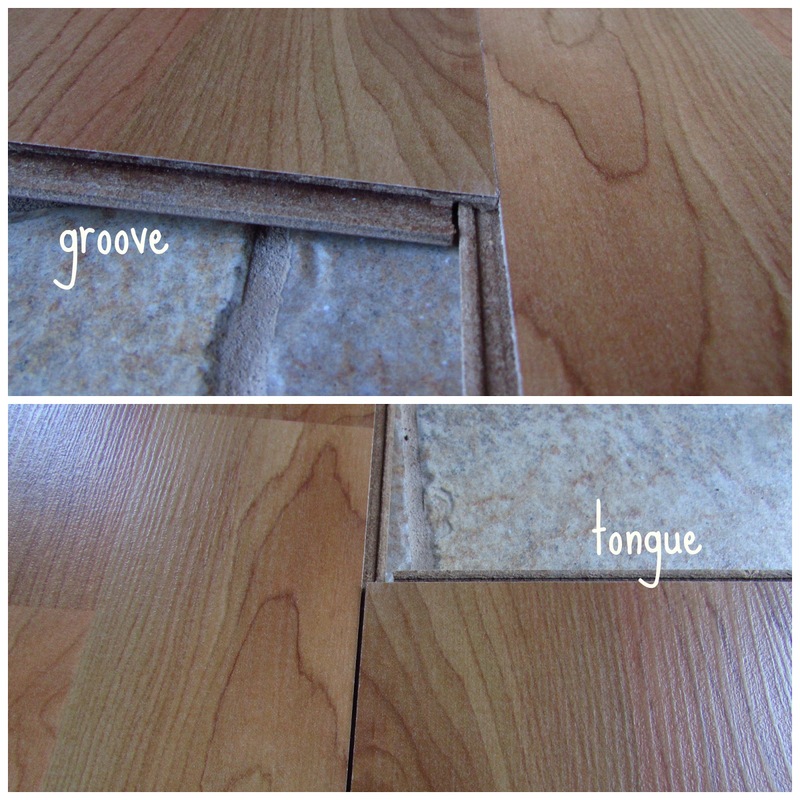 As you can see in the pictures above and below, the “groove” portion of floorboard is what lies flat on the floor and has a grooved indentation, while the “tongue” portion is the piece that floats a little higher on the edge of the floorboard and locks into place on the “groove”. There are also “tongues” and “grooves” located on the shorter (width end) portion of the boards as well that will be used when working on a single row of flooring. 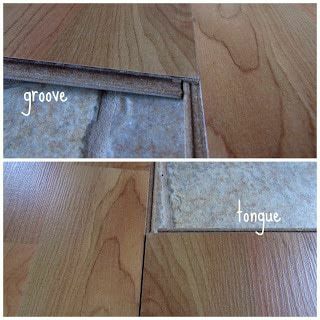 In my tutorial I will frequently be referring to the “tongue” and “groove” of the board, so these pictures are here to help you! 1. 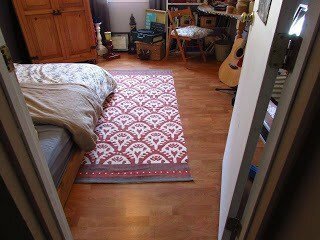 Pull up that old, gross carpet or flooring! 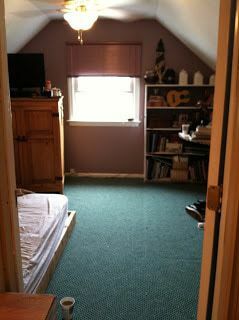 If you are pulling up carpeting, there will be nail strips in the floor that you will need your crowbar to lift. 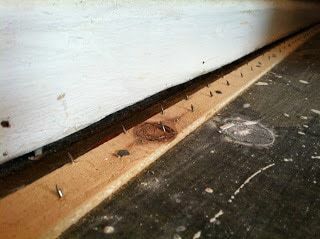 Make sure you remove all nails and staples from the floor before laying anything down. 2. Detach your floor mouldings with a crowbar, but be careful with them if you plan on recycling them for later. You can do this with a crowbar. 3. 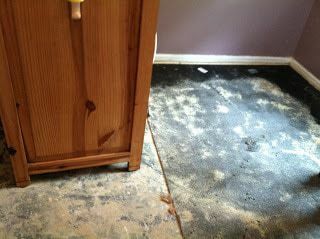 Once your floor is cleared lay out your underlayment. It usually comes in one large roll, so you may have to utilize your razor blade to cut the length down to the correct size. 4. 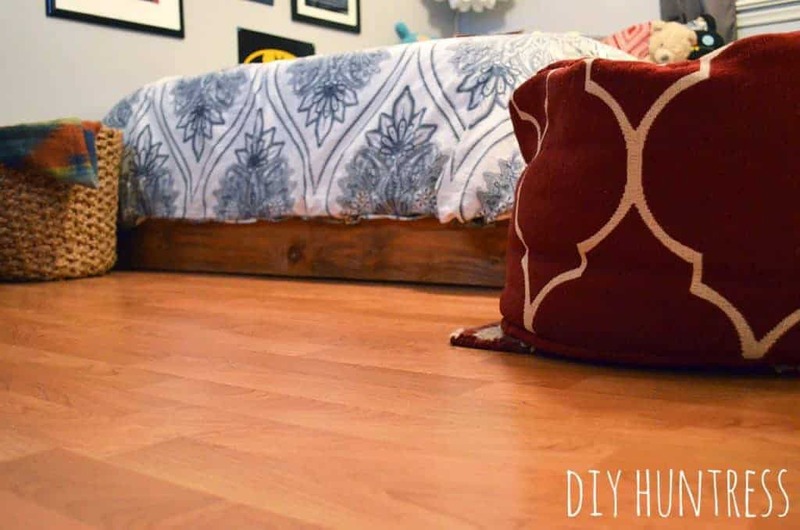 Once your underlayment is set, you can start laying down your floorboard. 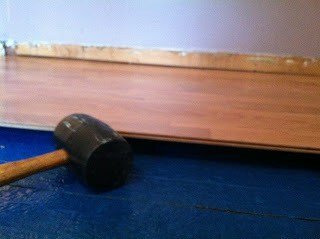 When installing your floorboard it is usually best to have the boards run in the same direction as the longest wall. You will have to start from one side of the room (not the center). Before you lay these floorboards in your first row only, you will have to cut the “tongue” portion of the floorboard off with your table saw. 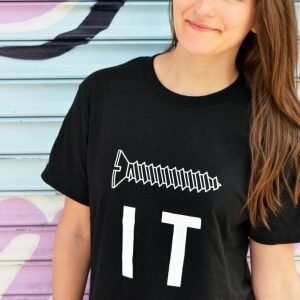 This will allow your floorboard to lay flush with your wall. 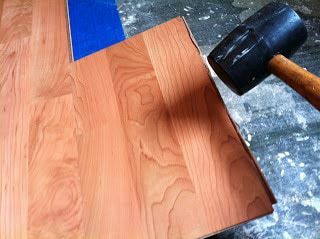 Once your first piece is in place, add the next piece to the shorter (width end) of the board by placing the “tongue” over the “groove”, clicking into place with your hands. 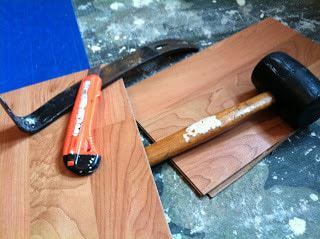 Then use a mallet and an extra piece of wood to insure that the pieces are clicked together correctly. Once your first row is done, you can then move onto your second row. Start your second row from the opposite end of the room that you started the previous row from. 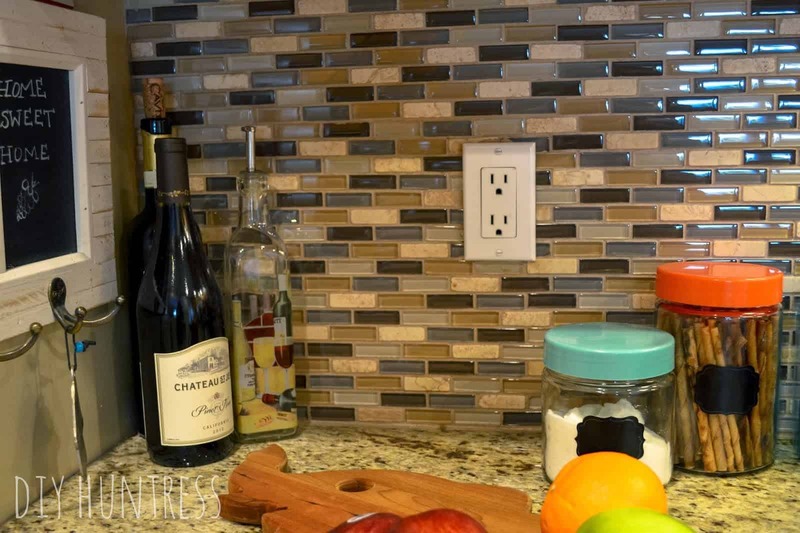 If necessary, you may have to cut the “tongue” of the next row’s board on the shorter (width end), to make sure that it remains flush with the wall. 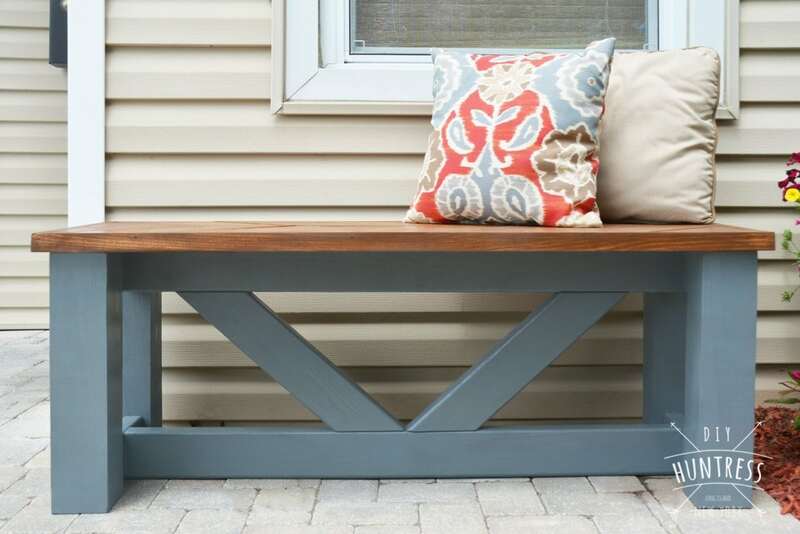 Once your next row is in place, repeat these steps for each additional row. 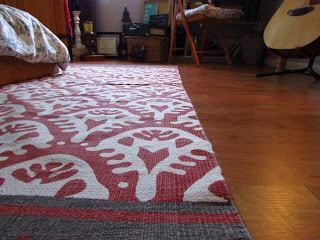 Start from the opposite end of the room with each row and cut the length of your last piece of the row so that it fits flush against the wall. 5. 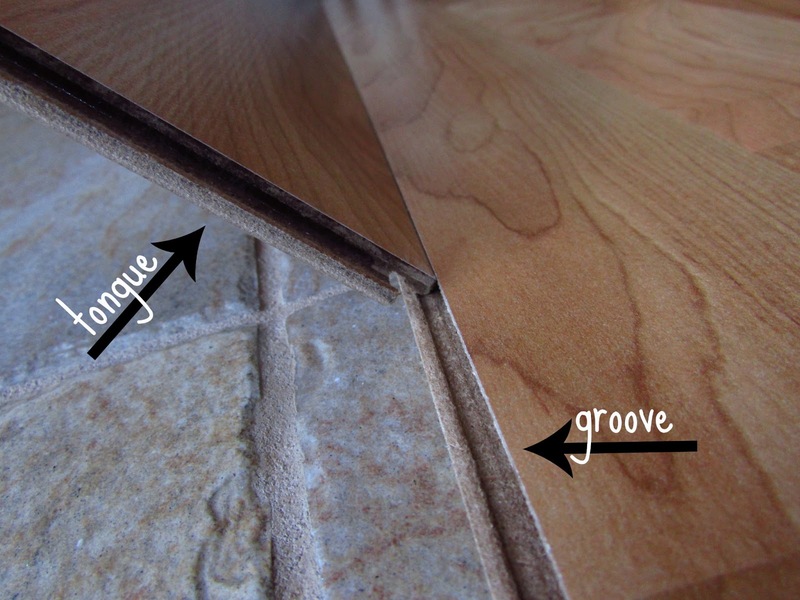 Once your flooring is in place, re-attach your floor mouldings. This will finish off the room as well as hide any smaller gaps that did not fit flush against the wall during your installation. 6. Sit back and enjoy your masterpiece! You deserve a break, and probably a drink or 3! 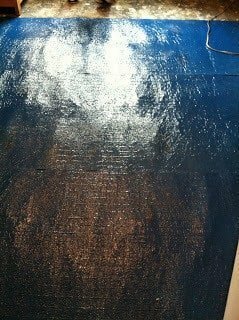 It never needs to be sanded down and re-stained. They have greater scratch resistance than many hardwood floors. It’s easy to clean and easy to install. 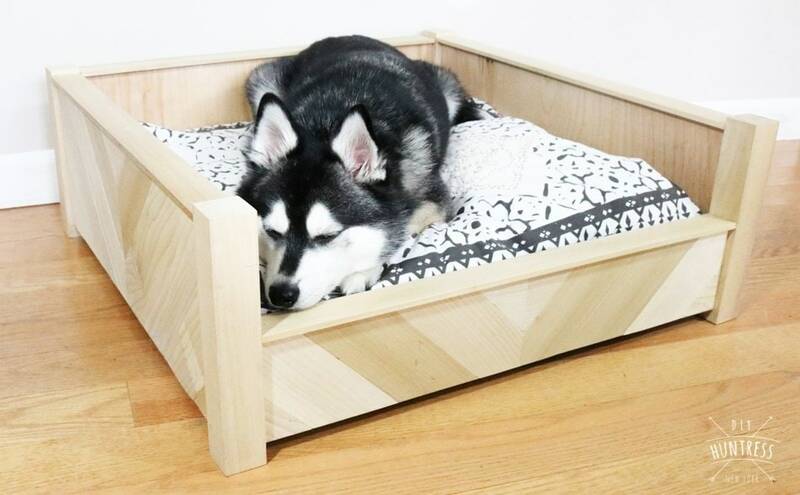 They come in hundreds of colors and textures for you to choose! Installing flooring can be really time consuming, and totally confusing. 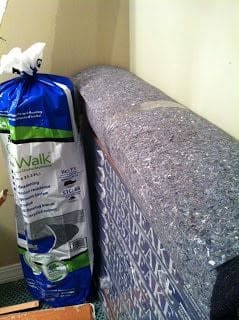 So, if you have ANY questions about flooring to choose, how to install it, or anything else, please feel free to ask! Oh wow, it turned out so so well! Thanks so much! Hope everything is well! 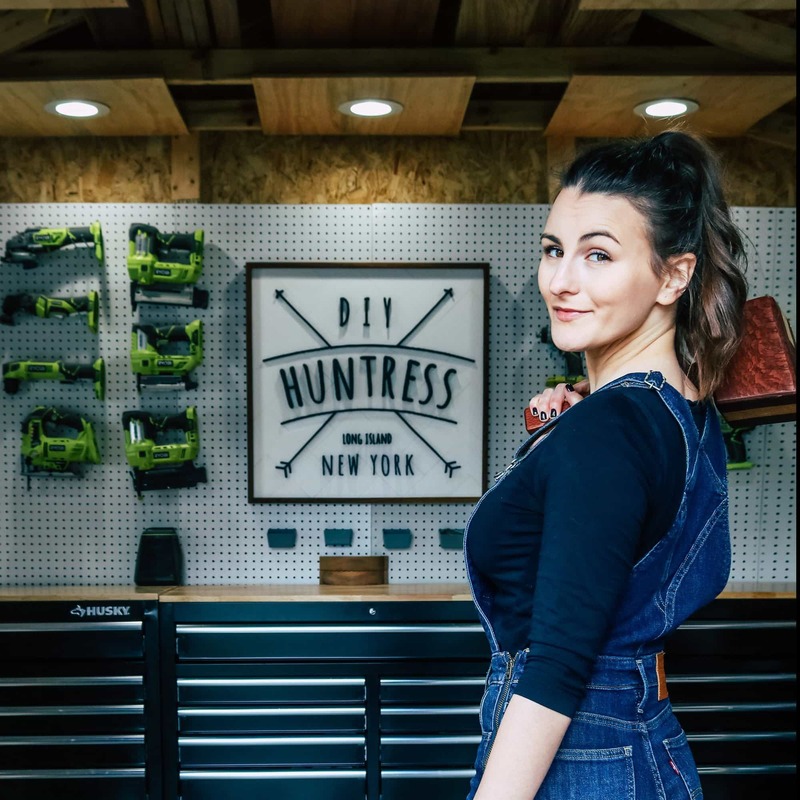 Thanks for stopping by I Dig Pinterest! I'm a new follower! Not a problem! Welcome! Please keep in touch!